This week's random butterfly is the very skittish Rustic (Cupha erymanthis lotis). In the field, the Rustic is always on the move, and is an active butterfly. 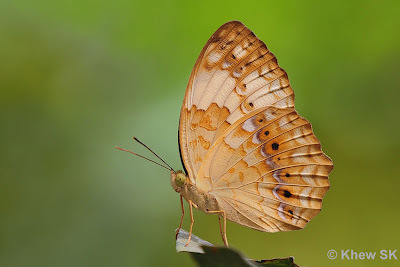 Even when it is feeding on flowers or puddling on muddy forest paths, it will flap its wings and twist and turn, making photography challenging. I encountered this individual in the nature reserves two weekends ago. Despite being skittish, and giving the two photographers who were chasing it a wide berth, it continued to stay in the area and flew from perch to perch in a small area repeatedly. It finally settled low enough on one of its favourite perches and allowed me to get a near full-frame shot of it, with the tall bushes in the background.